Sample #3 after Rotational Motion. Sample Lab Report #1 Title Write a descriptive title with your name, names of partners, date performed and TA name. Statement of the problem In a sentence or two, state the problem you are trying to solve. List the equipment you will use and the reasons for selecting such equipment. The problem was to determine the dependence of the time of flight of a projectile on its initial horizontal velocity. We rolled an aluminum ball down a ramp and off the edge of a table starting from rest at two different positions along the ramp. Starting from the greater height up the ramp meant the ball had a larger horizontal velocity when it rolled along the table. Since the table was horizontal, that was the horizontal velocity when it entered the air. See Figure 1 from my lab journal for a picture of the set-up. We made two movies with the video equipment provided, one for a fast rolling ball and one for a slower one. These movies were analyzed with LabVIEW to study the projectile’s motion in the horizontal and vertical directions. Prediction This is the part of the lab where you try to predict the outcome of the experiment based on your general knowledge of Physics. If your predictions were wrong and you understood it during the lab, write correct ones in your lab report. Also, attach initial predictions to your lab report and explain what was wrong. If you still have problems with the prediction, ask your TA or go to TA office hours for some help. Generally, predictions are based on the fundamental laws or principles. Therefore, refer to these laws as a starting point of your predictions. Our group predicted that the time the ball took to hit the ground once it left the table would be greater if the horizontal velocity were greater. We have observed that the faster a projectile goes initially, the longer its trajectory. Since the gravitational acceleration is constant, we reasoned that the ball would take more time to travel a larger distance. However, after completing the lab we understood that horizontal and vertical motion is independent. Therefore, for two given cases where the object had different initial horizontal velocity, the time of flight was the same. So, our initial predictions were wrong. Presentation of your lab report is an important part of the evaluation process. It has to be written in a clear and understandable way for your peers, TAs and Professors. We recommend using Microsoft Word for writing lab reports, especially for its handy tool - Equation Editor. Equation Editor allows you to type complicated mathematical expressions in a compact and elegant way. In order to use this tool go to Insert Menu àObject àMicrosoft Equation 3.0. Faced with a choice in sign, our group chose the solution with the positive sign, deciding that a possible negative value for elapsed time does not correspond with our physical situation. From equation (2), we deduced that if vo increased, then the time of fall also increases. This coincided with our prediction that a projectile with fastest horizontal velocity would take the most time to fall to the ground. For a graph of our predicted time of flight versus initial horizontal velocity, see Graph A from the lab journal. LabVIEW generated graphs of x and y positions as functions of time. Our prediction for the vertical direction was equation (1). Since the ball only has one acceleration, we predicted that equation (1) would also be true for the horizontal motion: x - xo = vo∆t + 0.5a∆t2 The dotted lines on the printed graphs represent these predictions. Our TA asked us to compare a bullet fired horizontally from a gun to a bullet dropped vertically. Our group decided the bullet that is fired horizontally will take longer to hit the ground than the one that is simply dropped from the same height. Experiment and results This section describes your experimental method, the data that you collected, any problems in gathering the data, and any crucial decisions you made. Your actual results should show you if your prediction was correct or not. To ensure the ball’s velocity was completely horizontal, we attached a flat plank at the end of the ramp. The ball rolls down the ramp and then goes onto the horizontal plank. After going a distance (75 cm) along the plank, the ball leaves the edge of the table and enters projectile motion. We measured the time of flight by simply counting the number of video frames that the ball was in the air. The time between frames is 1/30 of a second since this is the rate a video camera takes data. This also corresponds to the time scale on the LabVIEW graphs. We decided to compare the times of flight between a ball with a fast initial velocity and one with a slow initial velocity. To get a fast velocity we started the ball at the top of the ramp. A slower velocity was achieved by starting the ball almost at the bottom of the ramp. During the time the ball was in the air, the horizontal velocity was a constant, as shown by the velocity in the x-direction graphs for slow and fast rolling balls. From these graphs, the slowest velocity we used was 1.30 m/s, and the fastest was 2.51 m/s. After making four measurements of the time of flight for these two situations, we could not see any correspondence between time of flight and initial horizontal velocity (see table 1 from lab journal). As a final check, we measured the time of flight for a ball that was started approximately halfway up the ramp and found it was similar to the times of flight for both the fast and the slow horizontal velocities (see table 2 from lab journal). A discussion of uncertainty should follow all measurements. No measurement is exact. Uncertainty must be included to indicate the reliability of your data. Most of the uncertainty in recording time of flight came from deciding the time for the first data point when the ball is in the air and the last data point before it hit the ground. We estimated that we could be off by one frame, which is 1/30 of a second. To get a better estimate of this uncertainty, we repeated each measurement four times. The average deviation served as our experimental uncertainty (see Table 1 from lab journal). This uncertainty matched our estimate of how well we could determine the first and the last frame of the projectile trajectory. Conclusions This section summarizes your results. In the most concise manner possible, it answers the original question of the lab. Our graph indicates that the time of flight is independent of the ball’s initial horizontal velocity (see lab journal, Graph A). We conclude that there is no relationship between these two quantities. A good conclusion will always compare actual results with the predictions. If your prediction was incorrect, then you must discuss where your reasoning went wrong. If your prediction was correct, then you should review your reasoning and discuss how this lab served to confirm your knowledge of the basic physical concepts. Our prediction is contradicted by the apparent independence of the time of flight and initial horizontal velocity. We thought that the ball would take longer to fall to the floor if it had a greater initial horizontal velocity. After some discussion, we determined the uncertainty in our prediction. We did not understand that the vertical motion is completely independent of the horizontal motion. Thus, in the vertical direction the equation y - yo = vo∆t + 0.5a∆t2 means that the vo is the only the y-component of initial velocity. Since the ball rolls horizontally at the start of its flight, vo in this equation always equals zero. The correct equation for the time of flight, with no initial vertical component of velocity, is actually: y - yo = 0.5a∆t2 In this equation, there is no relationship between time of flight and initial horizontal velocity. Furthermore, the graphs we generated with LabVIEW showed us that velocity in the y-direction did not change when the initial horizontal velocity changed. Velocity in the y-direction is always approximately zero at the beginning of the trajectory. It is not exactly zero because of the difficulty our camera had determining the position when the projectile motion begins. We observed that the yvelocity changed at the same rate (slope of vy plots, graphs 1 and 2) regardless of the horizontal velocity. In other words, the acceleration in the y-direction is constant, a fact that confirms the independence of vertical and horizontal motion. After you have compared your predictions to your measured results, it is helpful to use an alternative measurement to check your theory with the actual data. This should be a short exercise demonstrating to yourself and to your TA that you understand the basic physics behind the problem. Most of the problems in lab are written to include alternative measurements. In this case, using the time of fall and the gravitational constant, you can calculate the height of the table. The correct equation for the horizontal motion is x - xo = vo∆t The horizontal acceleration is always zero, but the horizontal distance that the ball covers before striking the ground does depend on initial velocity. Since yo - y = h and a = -g we can check to see if our measured time of flight gives us the height of the table. From our graph, we see that the data overlaps in a region of about 0.41 sec. With this as our time of flight, the height of the table is calculated to be 82.3 cm. Using a meter stick, we found the height of the table to be 80.25 cm. This helped convince us that our final reasoning was correct. The example of the two bullets discussed in the Prediction section was interpreted incorrectly by our group. Actually, both bullets hit the ground at the same time. One bullet travels at a greater speed, but both have the same time of flight. Although this seems to violate "common sense" it is an example of the independence of the horizontal and vertical components of motion. References List books, journals or any other resources that you used to write your lab report.. 1. Tipler, Paul A. Physics for Scientists and Engineers. 4 th, W. H. Freeman: 1999. Title Write a descriptive title with your name, names of partners, date performed and TA name. Statement of the problem This is an introduction to the problem. In a paragraph or two, state the problem you are trying to solve and what you expect to learn from it. List the equipment you will use and reasons for selecting such equipment. In this lab our goal was to estimate the efficiency of the magnetic bumper. To do so we used an inclined track experiment. Our group released the cart from certain height and took a video of the carts motion before and after collision. The acceleration of the cart up and down the ramp was determined using video analysis. Using this data we were able to calculate efficiency of the magnetic bumper. largest contribution to uncertainty. Finally, compare the experimental results and theoretical prediction. Discuss any agreement or disagreement between them. Table. 1. Summary of experimental results. So the efficiency of the bumper is 85%. The uncertainty in this experiment basically comes from measuring the distance (uncertainty of the meter ± 0.5 cm), from analyzing the motion (uncertainty related to the video analysis can be estimated by clicking on the same point on the car’s image and recording its position) and fitting the experimental curve (uncertainty caused by the fitting of experimental points can be estimated by finding the largest deviation of the experimental point from the fitted curve or by varying the constants, for example acceleration, so that your equation still fits the data). Our group estimated uncertainty to be around 10%. For more information on uncertainty see Appendix B. Conclusions This section summarizes your results. In the most concise manner possible, it answers the original question of the lab. A good conclusion will always compare actual results with the predictions. If your prediction was incorrect, then you must discuss where your reasoning went wrong. If your prediction was correct, then you should review your reasoning and discuss how this lab served to confirm your knowledge of the basic physical concepts. In this lab we determined the efficiency of a magnetic bumper. After completing the experiment we concluded that magnetic bumper is very efficient (85%). Our conclusion is consistent with the previous lab results. Results check – efficiency of the bumper is indeed less than 100%, so our results make sense in terms of energy conservation. References List books, journals or any other resources that you used to write your lab report. 1. Tipler, Paul A. Physics for Scientists and Engineers. 4 th, W. H. Freeman: 1999. Fig. 1. Experimental setup: cart attached to two springs with different spring constants. We displaced the cart from equilibrium and then gently released it. The period of the oscillation was determined using a stop watch and video analysis. The cart was selected because it rolls with low friction; neglecting friction simplified our analysis. Video analysis provides precise measurements of the period, and the stopwatch provides an alternative method of checking the period. Prediction This is the part of the lab where you try to predict the outcome of the experiment based on your general knowledge of Physics. If your predictions were wrong and you understood it during the lab, write correct ones in your lab report. Also, attach initial predictions to your lab report and explain what was wrong. If you still have problems with the prediction, ask your TA or go to TA office hours for some help. Generally, predictions are based on the fundamental laws or principles. Therefore, refer to these laws as a starting point of your predictions (For example, if you are dealing with dynamics and forces, you can mention Newton’s Second Law as a starting point). Presentation of your lab report is an important part of the evaluation process. It has to be written in a clear and understandable way for your peers, TAs and Professors. We recommend using Microsoft Word for writing lab reports, especially for its handy tool - Equation Editor. Equation Editor allows you to type complicated mathematical expressions in a compact and elegant way. In order to use this tool go to Insert Menu àObject àMicrosoft Equation 3.0. To find the frequency of oscillation we have to determine equation that governs the dynamics of the system. Let’s start with Newton’s Second Law and find forces acting on the cart. equilibrium position forces change, which determines the motion of the cart. Therefore, from now on we are concerned with the change in forces with respect to equilibrium ones (here it’s useful to make analogy with potential energy – only change in potential energy matters). forces with respect to equilibrium. L2 is the relaxed length of the spring. x(t) = Asin(ωt + δ) + x 0 .
pointing dot during video analysis. One can estimate the uncertainty for this experiment by looking at the variation of the period on the experimental graph. Uncertainty of the experimental data is specific to the experiment performed. In general, uncertainty related to the video analysis can be estimated by clicking on the same point on the car’s image and recording its position. Uncertainty caused by the fitting of experimental points can be estimated by finding the largest deviation of the experimental point from the fitted curve or by varying the constants, for example acceleration, so that your equation still fits the data. Our group estimated uncertainty to be frequency to be f = 0.745 ± 0.08 Hz. conclude that our prediction adequately describe experimental results. During experiment we noticed that frequency of oscillations is slightly changing with time and it can be explained by effect of friction on the motion of the cart. ⇒ f = 0.67 Hz. This alternative measurement is within experimental uncertainty of our other experimental and predicted results. Finally, we noticed that theoretical predictions of above experiment coincide with side-by-side configuration. References List books, journals or any other resources that you used to write your lab report. 1. Tipler, Paul A. Physics for Scientists and Engineers. 4 th, W. H. Freeman: 1999. p 180, 928, 930. 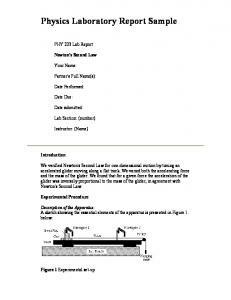 Report "Appendix E: Sample Laboratory Report"